The mauve thistles growing across the landscape contrast with the red rocks of the coastal seaside along the Cote d'Azur in Provence, France. 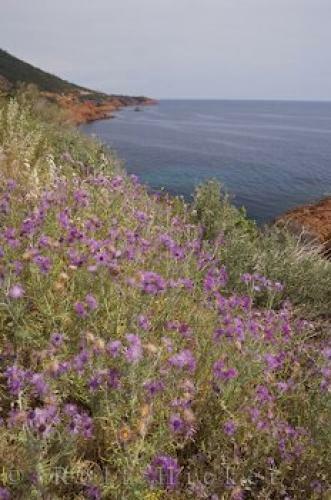 The mauve flowers, commonly called Scotch thistles, grow abundantly along this section of the coastal landscape of the Esterel on the Cote d'Azur in Provence. The red volcanic rock originates from the Massif de Esterel, and over millions of years it has made its way down to the seaside of the Mediterranean. The contrast of the mauve thistles, red rock and blue sea makes an colourful landscape scene.Scotch thistles along the rocky red coastline near Antheor, The Riviera, Cote d'Azur, Provence, France, Europe. landscape on the Cote d'Azur in Provence, France.